“Give me a minute,” he said. “Then I’ll tell you everything. I promise.” He reached under the console to the cupboard where he kept various things and pulled out a writing pad. He pulled a pen from his inside jacket pocket and sat there writing for a long time. Wyn was rather intrigued by the idea of him writing by hand. She was particularly fascinated by the way he passed the pen from one hand to the other and seemed equally well able to write with either. That didn’t make it any easier to get the words down on paper. He screwed up three drafts and lobbed them expertly into the trash receptacle besides the environmental console. Finally, he was satisfied and he put the letter in an envelope and wrote a single word on it in beautiful copperplate writing. “Yes, I did,” he answered. “I’m just trying to find the right words for it. Come into the drawing room. I feel we ought to both be sitting down somewhere comfortable.” He held her hand and she was surprised to find that it was shaking. There was something troubled in his brown eyes. She let him lead her to the rarely used drawing room with its vaguely Edwardian furniture and fake window that currently looked out onto the time vortex She sat down in a squashy armchair and he sat opposite her. The Doctor laughed momentarily and took her hand in his. “Oh, Doctor!” Wyn’s eyes were welling up with tears. He was holding back a hard lump in his own throat, trying not to cry himself. He held her a little longer than he intended. Long enough for a tomboy like Wyn, who tended to hide her feelings, to start to be embarrassed by it. But he needed, for just that little longer, to feel a real, living person near him. He was about to enter into a world where nothing was real, and everything was out to get him. For a little while longer, he needed her. “See you later,” he said at last and turned and walked away as she sat down in the chair again. Wyn looked at the food. She wasn’t hungry. She felt slightly sick. This was a nasty turn of events. After all they’d been through in the past couple of days, after all they had been through in the months she had been with him, could it all end so suddenly? Could he really DIE inside the TARDIS doing some kind of mind game? What would she do without him? Go home, of course. He was arranging for her to do that. He had prepared for the worst. The TARDIS was going to meet with the other TARDIS. If he didn’t make it and Nine did he could take her back. If they BOTH didn’t make it, Rose could get them both home. Except she would have to live in a universe that didn’t have The Doctor in it, and quite apart from how she felt about that, she wasn’t sure how the universe would get on without him looking after it. The first part of the rite was relatively easy. Purification of the body and soul simply involved a rather painful bathe in first scorching hot water and then freezing cold, followed by several hours kneeling in the Cloister Room, clearing his mind of all extraneous thoughts. Now the ordeal of the Rite of Progression would begin in earnest. 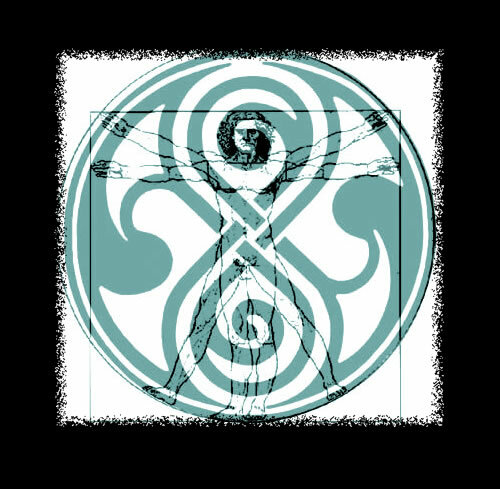 He stretched his limbs that were stiff from kneeling and laid himself down in the Seal of Rassilon pattern cast on the floor by the light of the great window. He stretched out his hands and feet to touch the edge of the circle. The effect was something like Da Vinci’s famous sketch “Vitruvian Man”. He allowed himself one random thought before he began to put himself into the deep meditative trance necessary for the Rite. He remembered sitting in Leonardo’s workshop, drinking wine and discussing those ideas about divine proportions and symmetry of form while he drew that much copied and parodied masterpiece. 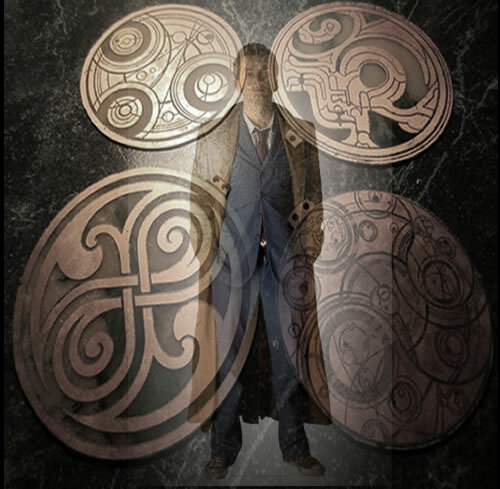 Of course he couldn’t tell him it was nothing new, or that Rassilon’s Seal was an abstract representation of the same idea, worked out by the mathematicians of Gallifrey millennia ago. He let go of his last memory of his old Renaissance friend, of all thoughts on the conscious plane, and dropped slowly down until he reached the necessary level of sub-conscious existence. He looked around him. The plain was everything Time Lord rumours had led him to expect - an apparently endless black desert stretching to the horizon. He turned around and there was a black ocean, its waves lapping the edge of the plain. He looked back over the plain once more. The horizon wasn’t totally level. There was a dark, purplish, jagged edge - a mountain range. Something told him the objective was to reach the mountains. A cold wind blew over the ocean and he shivered and realised something he hadn’t realised until now. He turned and saw an elderly, white-haired woman in a long dress of Gallifreyan design. She held out a folded black cloth. He took it from her and slipped the plain cotton robe over his head. He looked at her again once his modesty was covered. “You’re my… my grandmother,” he said. “This may help.” She stretched out her arms towards him, holding out a great sword in a finely wrought scabbard. He took it in both hands and stared at it. He recognised the markings on it. He took it. He turned and looked once again at the distant mountains. He took a deep breath and stepped forward. The sand was boiling hot. His bare feet burned. But there was nothing he could do about it. He couldn’t turn back. Well, he probably could. But then he would have failed in the first minutes of the ordeal. He had to make a better show than that. He kept walking, aware of every painful step. His feet weren’t damaged. His regenerative genes repaired the burnt flesh almost instantly. But it was a thoroughly unpleasant experience and he didn’t expect it to cease for a long time yet. He looked ahead at the distant mountains. How long would it take to walk there? A day? Two? Would there BE days as he knew them in this place? He looked up at the sky. It was a uniform iron grey colour and there was no way of telling where the sun, if there was one, was positioned. The natural method of working out the time of day on every planet he had ever set foot on did not work here. And yet, night did fall. He had been walking for what his personal body clock said was about eight hours when it began to get darker. But it got uniformly darker all over the sky, not like any sunset he had ever seen. It got colder as it got darker. That was natural, of course. He had been in several deserts in his lifetime. The Great Red desert of Gallifrey was one of them. The Sahara on Earth was another. By day they were unbearably hot. At night they were mercilessly cold. Though the robe made him feel less vulnerable in front of the projection of his venerable ancestor it did nothing to keep him warm. Only to a certain point, his inner voice told him. He hated that inner voice. It never had anything good to say. He kept walking as it got darker. What else could he do? That helped a little. As long as he kept on walking he kept his body moving and the cold didn’t get a grip on him. The problem, of course, was he didn’t know WHERE he was walking. He dreaded the thought of the light returning in a few hours to find him back at the ocean and his ancestors shaking their heads in disappointment and muttering about half bloods not being up to the task as they always did. A star at least! That would be something. He looked up at the empty blackness of the sky. It wasn’t a real sky. It wasn’t a real place. But could it not have something to help him – just one star for him to get his bearings with? He tried to listen to see if he could hear the ocean. But he had stopped being able to hear that after a few hours. There was nothing he could do to orientate himself. He just had to keep walking and trust his own instincts. Then he hit the quicksand. “Oh, come on,” he thought as his ankles sank into the liquefied ground. “This isn’t some old western movie.” Bad enough he was subjected to this ordeal, but to be subjected to such a clichéd trap was just insulting. He didn’t panic. He made small, slow movements. He knew if he did that he would be able to float on top of the quicksand and get himself out. That was where it all got silly in the movies, with people flailing around as the sand sucked them down never to be seen again. The thing to do was keep calm and still. The body, even a Time Lord one, was less dense than quicksand. It would float. He floated. He edged himself forward with slowed down swimming movements until he found a solid edge to the liquefied section of ground and pulled himself up. No problem - except he was now covered in thick, sticky sand. The robe was pasted to his body and there wasn’t an inch of his skin that wasn’t coated in the vile stuff. It dried on him as he carried on walking. He was almost glad it was dark. He dreaded to think what he looked like - some kind of mud monster, cracking and crumbling with every step. If he met anyone else on the plain they would probably run away screaming. It was getting colder. The mud bath hadn’t helped in that respect. His robe was saturated with the stuff. His body didn’t seem able to generate any heat at all. His teeth chattered and he shivered as he kept on walking. He didn’t need to rest. He wouldn’t die of exposure. He wasn’t Human. He didn’t have Human limitations on his endurance. He didn’t need any inner voice or anything else to tell him that he DID have a limit even if it wasn’t a Human limit. But he wasn’t there yet. He was covered in mud that he would probably still find in hidden places on his skin if he showered for a year. His muscles ached and his feet were killing him. But he was not beyond his endurance yet. He COULD go on. He went on - and on and on. He guessed there had been four or five hours now of darkness. He reckoned on four or five more. If this unreal world followed any real logical pattern that is. It might stay dark forever. It didn’t. He had walked for another four hours, he estimated, when it began to lighten. Again, there was no sense of sunrise. The whole sky simply got lighter little by little and the temperature rose. It was not long before the sand became unbearably hot again. He knew he was tempting fate. Even in the real universe it tended to be a mistake to say the space equivalent of ‘this ship is unsinkable.’ Here, it was an open invitation to trouble. “Yeti?” he almost laughed as he saw the creatures that appeared in front of him. He didn’t even bother to ask where they came from. They were a part of the challenge. He raised his sword as the first creature opened its mouth to reveal more teeth than any one creature ought to have. The last time he faced Yeti they weren’t real. They were robotic creatures created by one of the many megalomaniacs trying to take over the world. This time he wasn’t sure. Would he sink his sword into living flesh or into cybertronics? Either way, cutting off the head was a sure fire way to deal with them. He adjusted his hold on the sword and swung it horizontally. The sound as it cut through the flesh and fur and sinew and bone was unpleasant and the spray of the creature’s blood answered his question very definitively. He span quickly as the first creature fell and decapitated the second one. The third started to lumber towards him and then seemed to change its mind. He saw it crouch down next to the body of the other Yeti and start to tear at the flesh. He was slightly shocked at the cannibalism, but it at least gave him a break. He sheathed his sword and moved away, quickly, before it finished its first course and took a fancy for Doctor dessert. He was running so quickly he almost missed the airlock. He would have done if he hadn’t tripped over it. Because, after all, you just don’t look for airlocks in the middle of deserts while running from Yeti. He looked at it carefully. And he considered his dilemma. This was one of those things that came up all the time in his life - the choice. Open the door, the airlock, the secret panel, jump into the pit. Get involved, or walk away and leave it well alone. And he had NEVER once managed to do the sensible thing. He had never walked away, and he always got himself into a heap of trouble. That would be the test, of course. Would he have the resolve to leave well alone? Could he act against himself? Or was it? Maybe the test was simply what was inside there. Inside there was inside at least. It wasn’t baking hot and it wasn’t freezing cold. And it wasn’t a bloody great storm. He looked to the horizon and saw dark clouds roiling under the flat iron grey. A cold wind with the taste of moisture in it ruffled his hair and went straight through the useless robe. In a few minutes he’d be walking into the teeth of a real stinker of a rainstorm. He opened the airlock and dropped down. The storm clinched it. He was just seeking shelter from the elements - nothing to do with incurable curiosity. A tunnel - rough cut but not natural. It was made by cutting tools, just like a mine. It went two ways - another decision. He remembered once explaining to one of his companions the Chinese principle of I-Ching. He couldn’t remember for the moment which companion or which life he was living at the time, but he remembered explaining how the Chinese believed that every decision should be random, left to chance. When faced with two corridors equally as likely to lead to either freedom or certain death, toss a coin, play rock, scissors, paper, eeny meeny, miny mo - anything but make a conscious decision. He didn’t have a coin. Rock, scissors, paper needed two people and eeny meeny didn’t work when there were only two choices. He closed his eyes and turned around several times then opened them facing right. Then just to confuse Fate he turned around and went to the left. He had been walking a good ten minutes before he thought to wonder why he could see perfectly well and mentally kicked himself for not thinking about that. Of course, the laws of the physical world didn’t have to apply here. But he wondered if he had dropped some points with whoever was marking him for not thinking about that. It wouldn’t have helped if he had. He could see no source of light. It just wasn’t as pitch dark as it ought to be. He kept on walking. Walking, walking, walking! The endurance part of this was certainly covered. Nobody could accuse him of not having staying power. He turned a corner and his eyes were blinded momentarily by the bright light. When they adjusted he saw that the source of it was a giant plasma ball, nine or ten feet high, like a mobile sun. He could feel the heat of it. He could see how the walls of the tunnel were being turned to glass as it moved along rapidly. He turned and ran. He didn’t bother to argue about causality or physics or anything else. He knew there was no way to fight something like this. The only thing to do was run. The plasma ball came after him. He was outrunning it, but not by very much. He had to keep going. He passed the place where he had come down into the tunnel. He recognised it by the fact that the ground was wet. Torrential rain was pouring in through the open hatchway. But there was no way back. He had jumped down. There was no ladder. He kept on down the right hand tunnel and told I-Ching to join Narrative Causality for a drink at the bar and leave him alone. His hearts were pounding and he was breathing hard as he ran for his life. One touch from that thing and his molecules would be forming a rather interesting patina on the glazed floor. Regeneration didn’t come into it. What his REAL body would look like, still lying on the floor in the Cloister Room, he didn’t want to wonder. There was that old Gallifreyan urban legend about a Time Lord who was decapitated on the plain of Attrition and in real life his head fell off. The story was hazy about who that luckless Time Lord was and he didn’t entirely believe it, but he wasn’t taking any chances. The Rite of Progression was spoken of in whispers and not just to give the tyros at the Prydonian Academy even more nightmares to contend with on their first night of boarding school. There was a bulkhead door ahead. If he could get it open in time and get through he was safe. If it was jammed, he was trapped. It turned. He opened the door and slammed it shut behind him. He saw it grow white hot momentarily and wondered if the plasma ball was just going to melt it. Then it grew cold again. He turned and looked straight into the eyestalk of a Dalek. “Oh, the hell with that,” he said as it went through the familiar annoying rhetoric. “That’s right,” he said as he grabbed the eyestalk with one hand and with the other raised the great sword. It was as sharp as a razor and it sliced right through the eyestalk. Polycarbide 0 – Good, sharp, ancient Gallifreyan sword, 1. The Dalek shrieked in confusion and possibly pain and turned randomly, unable to see where it was going. It fired off its ray gun but it had no idea what it was shooting at. The Doctor dodged around the back of it and simply pushed it over. The ray gun back-fired as it hit the ground and the Dalek screeched one last screech as the polycarbide body cracked open. The smell of recently dead Dalek biological unit filled the air. The Doctor looked at it without pity. One Dalek down against all the millions he had fought. He turned and reached to open the next airlock. He screamed in agony as he felt his flesh searing, his right eye blinded by the force of the explosion, his arm almost entirely blown off at the shoulder, a gut-wrenching agony as a shard of metal pierced his stomach. He stood up slowly. The pain of his injuries was almost too much. He reached and touched the right side of his face expecting to find bloody chunks of it missing. He was surprised to find that it FELT undamaged. His pain receptors were telling him his body was in a ghastly mess, but he looked all right. He touched his stomach where he KNEW he ought to have been spilling blood and bile out of a huge hole. There was nothing. And he was USING an arm that his brain told him was nothing but a bloody stump. He looked at the debris-strewn room beyond the seat of the explosion, and his hearts cried out as he recognised his own TARDIS console room. He stepped forwards into it and looked around. It was cool and quiet and just as he had left it, apart from the doors that had been blown off. THAT was impossible, of course. The TARDIS doors could withstand the heat of a Dalek ray. It could stand being enveloped by the sort of sun-hot plasma entity he had run from before. What was it he once said – the massed hordes of Ghengis Khan. A sub-atomic detonation might just do it, but that would have taken the whole TARDIS out, not just the doors. He looked at the environmental console and it told him what he figured. This was only an illusion of his TARDIS. It wasn’t really anywhere. Even so, he had a feeling he ought to go to the Cloister Room. He was right. He looked at the pitiful wreck of a body lying in the centre of the Seal of Rassilon. All the injuries he thought he could feel were manifest in this copy of himself. His face was a wreck. One eye was gone completely, a bloody socket was all the remained. The cheek was gone. The cracked cheekbone and jaw were exposed among the pulp of destroyed flesh. His right arm was hanging by a shred of sinew. His torso was burnt and blackened and a spear of twisted metal protruded from an ugly wound in the stomach. The eyelid flickered. He took that as a yes. It helped them both to bear the pain. In his own head the agony felt a little less severe, as if somebody had administered a slow-acting local anaesthetic. “It’ll hurt like hell,” he told him as he grasped the shard of metal. And it did. From somewhere inside both of them gave an animal scream as he pulled. The metal was twisted like a corkscrew. Flesh ripped as it came out of his body. The Doctor fell back, holding the gore-covered piece. For a moment he could do no more than lie there next to his doppelganger. It hurt too much to move. Then, slowly, he picked himself up. “Are you still alive?” he asked. “I think you’re supposed to go on with the journey,” the projection told him. He felt it deep inside. His body was giving up its own energy, its essence, as the wounded projection used the energy to close the ugly hole in his stomach, the most life-threatening of the wounds. It was a slow process. The injuries were bad. The Doctor put himself into a slow trance, not too deep, but enough to recover the lifeforce he had given up. After an hour he felt able to give another burst of it and speed up the slow regeneration of the damaged tissue. It weakened him even more that time, and it was three hours before he could help again. But very slowly the physical wounds were healing and they were both feeling less pain. “I think you’re going to be okay now.” As he came out of the trance the last time, after nearly thirteen hours of slow, painful tissue regeneration the projected version of himself spoke aloud. The Doctor looked at him. He was looking all right except…. The projection blinked both eyes and the bright blue replacement turned brown to match the other. “You’re a good looking man,” he told himself. “So are you,” his other self replied and then slowly faded away. He knew what had happened. He was mended now. There was no pain, so he no longer needed the projection. Even so, he felt a little pang of loneliness. Even talking to himself had been nice for a while. He stepped out of the Cloister Room. He was still in the ersatz TARDIS. He had expected to be somewhere else. The unreality of this place made it possible for him to be just about anywhere. But in fact he was still in the TARDIS. And that meant he could take a few advantages before he moved on again. He found the bathroom. Before the purification ritual with the hot and cold water in the swimming pool he had begun with an ordinary shower. His clothes were on a chair in the bathroom, neatly folded. His TARDIS key and sonic screwdriver were sitting on top of the pile. But he started with a shower. And it was BLISS. He had been dirty for so long he had almost forgotten how nice it was to be clean. When every trace of quicksand and mud, Yeti blood, Dalek lubricant and sweat had been washed from his body he dried himself on soft towels that felt like clouds and then dressed himself, savouring the luxury of underwear, socks, the comfort of a cotton shirt and trousers. Out of sheer habit he put the tie on neatly and the pinstripe jacket. He fastened the laces of his canvas shoes happily. He stood up, putting the key and sonic screwdriver in the pocket and fastening the scabbard of the family sword around his waist. It spoiled the geek-chic mature student look but he figured he might still need it. And if it was still raining outside he’d need the long tan coloured overcoat, too. He paused in the console room. He touched the console with one hand, the other rested in his trouser pocket as if he was pretending to be casual about the loving caress he gave to a mechanical object. It wasn’t his REAL TARDIS console, of course, but he owed it thanks for the respite from what lay ahead still. He smiled bravely as he reached for the door opening mechanism, remembering at the same moment that the door seemed to have mended itself. It was still raining, hard. He steeled himself and stepped out into it. It was daytime - getting on for the evening of a day he had spent inside the TARDIS. He would be walking in the dark soon enough. But he got his bearings on the mountains at the end of the plain. They actually DID look closer now. He didn’t even bother to reason that he had not run THAT far in the underground place. He did make up his mind to ignore any more airlocks. It must have been his Human side that the curiosity came from. His own people, the Time Lords, were never curious about anything. Which Earth philosopher was it who noted that if there was a huge bathplug on a chain that would empty out the universe if pulled a HUMAN would be the one to pull it? He had forgotten which Human had taken the trouble to work out that you get less wet if you walk in rain rather than run. But he had soon reached the stage where it didn’t make a lot of difference either way. His coat was saturated and he was starting to feel it seeping into the fabric of his jacket. It felt horrible against skin when it got wet and both coat and jacket were the sort of fabric that weighed twice as much when waterlogged. It made the walking that much harder. But it was only physical discomfort. And it WAS just discomfort, not pain, not anything he couldn’t endure. All he had to do was keep going, through the storm. It was somewhere in the middle of the night that a stray lyric from his younger days when he listened to Bob Dylan a lot came into his mind. “In another lifetime!” Did Dylan stumble across his diary some time or other? That song went off on a weird tangent as so many of them did, but that opening verse seemed almost to fit him. He’d been given shelter from the storm a few times in his life. A face came into his mind that would always warm him. But it was better not to think that way. Trouble was, he couldn’t think of a single song about riding out a storm that was about somebody doing it alone. There always seemed to be a warm, feminine hand involved somewhere along the line to give hope and support. Singing just reminded him he was alone. And that was the one thing that WAS getting him down about all this. He could handle everything that was thrown at him, but he didn’t want to do it alone. Without somebody beside him, there was very little point in anything. The effort had to be for something or somebody other than his own gratification. That was why he had sought out companionship along the great endurance test of his life. That was why he risked his hearts on losing them, because he needed them all so much. “So really you’re just using us?” A voice said accusingly. He blinked away the rain and looked at the sweet, elfin face of Jo Grant, looking as she did when he knew her first. Except that usually she was smiling then. Now she looked hard and cold towards him. “You left ME to die on Gallifrey,” another voice said and he looked at the face of Leela, the beautiful tribeswoman he had called ‘Savage’ even while he admired her capacity to rise above her beginnings and gain sophistication of a kind. He cherished her memory as much as any of them. “What about me?” He was so shocked when he saw the next apparition from his past he hardly noticed that the rain had stopped. “Rose?” He looked at her and the echo of that song lyric came back with a vengeance. “You killed me,” she said. “No,” he answered. “If it was REALLY you, and I had the chance, then I might. But you’re not real. This is a projection, and it means nothing if I do either of those things.” He turned away and then turned back again. He felt a slight shock when he realised that she had turned into a cyberman. The voice that spoke next was the tinny, staccato voice of a cyberman with just a hint of Rose’s cadence in it. “Yes,” he answered, and he swung his sword arm back and cut the head of the cyberman off before slicing down through the torso. Before it fell he grasped the processor that made the body function and kept the brain alive – the ‘heart’ to use an entirely inappropriate word for something that wasn’t life as he recognised it. He dropped the processor and looked at his hands. They were shaking. He steadied them. Physical endurance, physical pain, mental torture. What more could they inflict on him to prove his worth? And what exactly was different about any of this to the physical endurance, the mental and physical pain, the mental anguish he had suffered most of his life? What physical pain compared with going through bodily regeneration nine times? What mental anguish compared with watching his own planet die? What endurance test was harder than just going on year after year, living 1,000 years when everyone he ever loved outside of his Gallifreyan family was a frail, short-lived Human? The Rite of Progression might be tough for Time Lords who spent their lives on Gallifrey, arguing politics, writing dusty treatises, watching the universe and doing nothing about it. But when all was said and done, it was a walk in the park for him. A not very pleasant walk, through a park designed by Hieronymous Bosch on one of his off days, but apart from that, nothing special. “You don’t have a home,” a disembodied voice told him. “It’s not your decision to make,” he was told, and the voice was drowned by the roaring of an inferno. The Doctor stepped back away from it. Fire. He’d been afraid of fire all his life. It stemmed from a trauma he could never fully remember when he was a child, and it stayed with him all his adult life. It always seemed to him the cruellest fate for Gallifrey that it was consumed by fire. His fractured half memories of watching it burn simply exacerbated that phobia. But he had always fought against it. He had never been afraid of tackling fire, any more than he was afraid of tackling Daleks, or any sentient foe. He had never run from danger. He was supposed to face that fear now. Well he would do that. He stepped closer to the wall of flame. It WAS just a wall. He could see through it. He saw the Cloister Room in Nine’s TARDIS. He saw his other self lying there in the circle of the Seal just as he had done. Except Nine had put a robe on first. Why didn’t he think of that? The Cloister Room was on fire. Flames were licking around the base of the two silvertrees that held up the ceiling. They were pouring across the floor like liquid. Nine was in serious danger as he lay there. Kill one and let the other live? Yes. If it had to be that way. But as much as he wanted to live, his logic was correct. It was more important for Nine to live. He stepped through the wall of fire. He did it quickly and he only felt his flesh scorch for a moment. But inside the Cloister Room it was hot and the air was full of choking smoke. He closed off his lungs and fought his way to where Nine was lying, in a deep meditative trance, oblivious to the danger. “Come on,” he said, trying to lift him. He was deadweight. And that wasn’t right, he was sure. Nine was the same height as he was, not quite as slim, but there wasn’t much more than an inch either way and maybe a few pounds in weight. He should have been able to lift him, but he couldn’t. He heard a creak above him and looked up to see the flames licking the ceiling. It was cracking ominously. It was going to fall. “No!” he cried out as he covered his other self with his own body and took the weight of heavy falling plaster, glass and wood on himself. “One of us, not both,” he added. He woke and stared up at the ceiling of the Cloister Room. It was intact. There was no fire. He sat up and looked around. This was his OWN Cloister Room, in his own TARDIS. It was real. He was sure it was. The last two times it hadn’t been, but this time it was real. He was fully dressed, if slightly damp, and was still wearing the family sword around his waist. Which was odd since he had laid down in the seal naked after the purification ritual and the sword, surely, belonged in the unreal Plain. But he didn’t worry too much about that as he stood up and sprinted to the console room. There was a realness there, too. He saw a blanket on the sofa where Wyn must have cat-napped in the long days of waiting, a chocolate wrapper and a coke can near a waste paper bin she must have thrown them at and missed. He looked at the environmental console and it told him that the TARDIS was on SangC’lune, the planet of the Time Lord pyramids - the place he and Nine had agreed to rendezvous. If he was alive. Did that mean…. He ran to the door, wrenching it open manually. The computerised door opening mechanism was too slow. As he opened the door Wyn reached for it from the outside. Instead she launched herself at him, her arms around his neck in a way that was more than a little uncomfortable, but he would not have stopped her in a million years. He hugged her back enthusiastically, and as he held her tight he saw the other TARDIS and Nine standing by it, dressed in his usual black leather and woolly jumper. He was embracing Rose as if they had been parted for months, not days. He had been lied to. It wasn’t an either or.